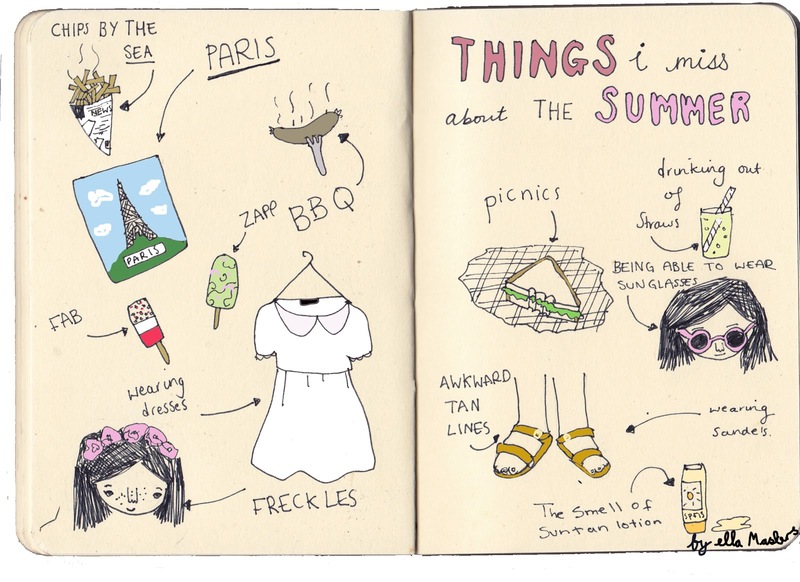 Its so cold at the moment in london, that I am missing so many things about summer that I thought I would put together a little doodle. Oh I miss the warmth of the sun on my skin. I am sure I could do all these things now in the winter but these things remind me of the summer. As for my longing to travel back to Paris the only way I might be able to settle this wanderlust is to watch Midnight in Paris…. I'm not a big fan of Summer and hot weather, however after all this snow I'm finally looking forward to it and the smell of suntan lotion! Super cute doodles as always Ella! I LOVE these doodles!! I miss wearing sandals + dresses (without tights!) too!! I couldn't agree more! I want summer so bad!! i miss the sea. I don't like summer because it's just so unpredictable here in Australia but I do love all the other seasons especially winter.